George Shirley Denison was born in Toronto, Canada West, on May 17th, 1846, the eldest child of Robert Brittain Denison (1821-1900) and Emily Anne Winn (1822-1867). He was born into one of the most influential landholding and military families in the city. From the diary entries we know that he attended Trinity College in Toronto and underwent some level of military training. In 1869, Denison married Julia Isabella Jordan (1848-1927), and they produced four children. The eldest, John Shirley Denison (1870-1951), was a prominent lawyer in Toronto and served as Treasurer of the Law Society of Upper Canada from 1944 to 1947. George Shirley Denison died in Montreal on April 25th, 1876, a few weeks before his 30th birthday. 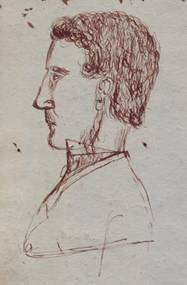 A possible self-portrait of George Shirley Denison (below). It appears on the back cover of the ledger above several copies of his signature (above). The daily entries of George Shirley Denison were recorded in the back section of a financial ledger, which may have originally belonged to his father. The ledger forms part of the Denison family fonds (PF6) housed by the Archives of the Law Society of Ontario. The entries cover a year-long period, from June 23rd, 1862, to June 19th, 1863, when Denison was sixteen and seventeen years of age. 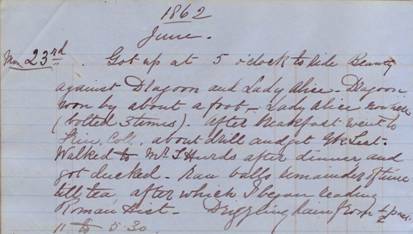 The diary shows the life of a teen from a prominent family during mid-19th century Toronto. Entries relate to his daily activities and outings, many of which concern his schooling at Trinity College and military exercises. Family matters are often mentioned, as is the weather and events in the city. Several family members are mentioned in the entries, including his parents, his Uncle Richard (Richard Lippincott Denison, 1814-1878), Uncle George (George Taylor Denison, Jr., 1816-1873), his brother Evelyn (Robert Evelyn Denison, 1858-1922), and his Aunt Coates. The diary entries have been transcribed as closely as possible to the original. Words which are abbreviated in the text have been left as they appear in the original. Punctuation and capitalization have also been left as they appear in the original entries. Any words that cannot be identified are represented by a hyphen and a question mark inside square brackets. Law Society of Ontario Archives, Denison family fonds, “Diary of George Shirley Denison”, 984016-1-2.